Tom joined as a member due to its alignment with his studies and interest. During his time at UIC, he was elected as vice president and then later president. Before graduating, he expanded their food donors to 30 restaurants in the Chicago French Market and the University hospital cafeteria. He also helped write a proposal to have UIC have a permanent intern position that assisted with recoveries. One Piece of Advice you would give to CHIPs or OCs that are struggling? Find partners. There are so many people out there who want to help however they can, sustainability departments, professors or even just an employee at a restaurant you want to work with. Each person can have a huge impact on recoveries. Food Recovery is not only critical to helping people who are facing hunger, but also to mother nature and saving the planet. The production and transportation of food takes massive amounts of water, land, and energy. Our food use contributes to greenhouse gas emissions, which impacts our air quality and global warming. 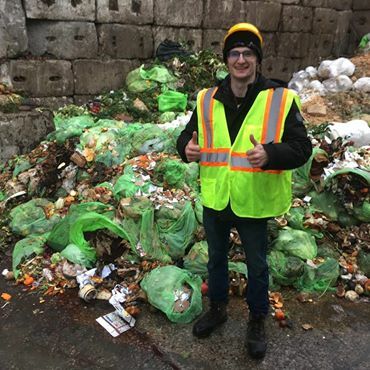 Tom Straus, an alum from University of Illinois, Chicago, took efforts to further food recovery and protect the environment. Tom has always had an interest in the outdoors and the environment. Call it a green thumb or maybe a green heart. From studying economic systems and food waste, he immediately saw the benefits of FRN — feeding hungry people and reducing the amount of food waste. But Tom always thought his chapter, and he, himself, could do more. With his position as a manager at the Chicago French Market, he was able to increase his chapter’s food donors to 30 local businesses. He also wrote a proposal to the Office of Sustainability to have a permanent intern work with their chapter, ensuring that each year their chapter would have school support and was up and running season after season. But, alas, what if you could do more? For all the food that goes to a person in need; what about the scraps and leftovers that cannot be rescued? Food that is still going into the trash is impacting the environment in a negative manner. How can we fix that? Tom, as the Administrator for the Composting Club with The Urban Canopy, works to advocate and manage composting in the city of Chicago. For those of us who are unfamiliar, composting is compiling organic matter so that it can be repurposed as fertilizer in order to better the soil and reduce the amount of methane gas and water that is produced and used to breakdown garbage at a landfill. Many composting companies, like The Urban Canopy, provide bins for compostable materials and will even pick up your compost every week. They also distribute wheatgrass, kombucha, and weekly selections of seasonal produce, fresh eggs from local farms and baked goods. Tom is involved with the whole process, from helping pick-up the compost to running a compost benefit program to increase the amount of companies and individual households that compost. The Urban Canopy is also looking to create and increase the existing CSA (community subsidized agriculture) systems in Chicago. Not only does composting help with the reduction of food waste, but with the prepaid boxes from the local farms it decreases the amount of food waste from the source! One of the benefits that Tom and his team created is that for every 10 compost pick-ups members receive a small gift card to one of the local companies that also compost! This gives recognition to businesses that might fall under the radar; the compost also goes back to the local farms that they are delivering the produce! Tom also serves as a member on two boards, The Plant Chicago and Food Recovery Network’s Student Alumni Advisory Board (SAAB). Tom also holds a position with the auxiliary board at Plant Chicago, leading the Education Committee’s efforts with K-12 students, teaching them about sustainable food production, energy conservation, and material reuse. He helps schools get approved for field trips to the composting facility and plans demonstrations in the classroom. With SAAB, he is working on increasing FRN’s outreach to students and assisting the students with the partnerships they have with their dining providers.